WHAT a winner -- a terrific treat for spring! This asparagus side -- it's simple, it's quick, it's easy, it's low in calories, it's low in carbs, it's a tad unusual AND it tastes great. My first-time use of anchovies during December's Paper Chef was so successful, I felt emboldened to try the stinky little fishies again in a warm pepper salad -- also delicious. So expectations were high for this saute of fat asparagus spears, garlic and anchovies. But I was completely enchanted -- the asparagus essence remained firmly intact but was at the same time turned into something entirely different. This is a complete keeper! Starting out, I wondered if this treatment would be good for fat asparagus spears, also if the stem ends should be peeled. No problem on either count: the strong flavors are perfect for thick asparagus and there was no issue with stringy skins. Seriously Good is collecting asparagus recipes during April and May. If you're cooking spring spears, let Kevin know! This is my first use of the cooking magazine Eating Well -- how in the world have I missed out on this til now? It's terrific! 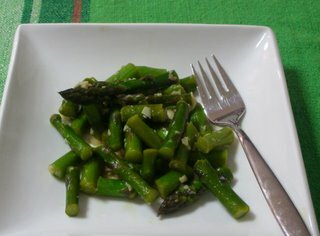 FROM THE ARCHIVES ... See the Recipe Box for other ideas for cooking asparagus. Heat the oil until shimmery on MEDIUM HIGH in a skillet large enough to mostly hold the asparagus in a single layer. Once the oil is hot, add the garlic and red pepper flakes and cook a minute, stirring constantly. Add the asparagus spears (leave the tips out for now), water and anchovy paste and stir gently but thoroughly to disperse the anchovy. Cover and cook for about 5 minutes, stirring occasionally. Remove the cover, reduce the heat to MEDIUM, add the asparagus tips. Continue to cook, stirring often, until asparagus reaches desired level of doneness - my preference is a shade past tender-crisp. When you see this ♥ or ◄ in the title or and the Recipe Box, you know the recipe's a personal favorite. Tastes vary, of course, but the mark is one indication of another vegetable recipe that's worth paying attention to. Welcome back! I missed you! Don't forget, we're going to make another of Karina's recipes (although she's gone until mid May) - your choice! Ahh!! I love anchovies, but never thought to put them on asparagus. I know that has to be delicious. This sounds absolutely wonderful, Alanna! I love both asparagus and anchovies (yes, I'm one of "those people" who always want them on a pizza! ), but have never thought of putting them in the same dish. What did you serve this with? This time it's me bookmarking! This sounds really good! Hi all - what a comeback, yes? with such good asparagus! Catherine - NOT forgotten, promise! Sher - if you love anchovies, you'll love this! Tania - yay, another anchovy lover though can't say I am but I'm loving them IN things ... maybe some day! I'd had a big lunch so a serving was basically 'supper' but I'd recommend them alongside grilled meat, or even atop a buttery pasta. The anchovies make the asparagus taste/feel more substantial than typical. Ilva - if you bookmark it, it's got to be good! I've been wanting to try anchovies, and this sounds like a great way to do it. Found you from "Seriously Good". Great site! What a wonderful sounding dish. I'm definitely going to try this one out.